Select a + sign below to discover the answers for our most frequently asked questions. If we don’t answer your questions here, please don’t hesitate to contact us. Go iLawn Basics: What is Go iLawn, how does it work and how do I start? Go iLawn is an online property measuring service for green industry professionals. 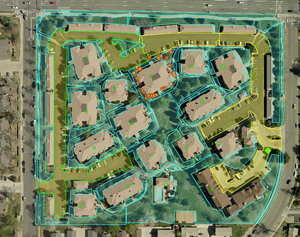 Go iLawn combines high resolution photographs, measuring tools and property information in one easy-to-use application. It allows you to obtain accurate measurements from the convenience of the office. It’s simple! First you enter an address, business name or street intersection to locate your property and Go iLawn will return a property photo to you. Then, with a few clicks of the mouse you can measure any outdoor surface on the property. Save all of your measurements to an Excel spreadsheet and property photos as jpeg files to your computer. You can subscribe to Go iLawn online or over the phone with a Go iLawn rep. We have plans to fit any company’s needs. Visit the Pricing & Plans page to learn more, or call 800.270.6782 Monday-Friday between 8-5 EST. You can also send us an email. Property Photos and Imagery: Why are the images so clear, how old are the photos, what is your coverage area? Why are the images so clear? Go iLawn uses high resolution aerial photography (taken from a plane). Aerial photos are clearer than a standard satellite photo because they are taken much closer to the earth with a high resolution camera lens. 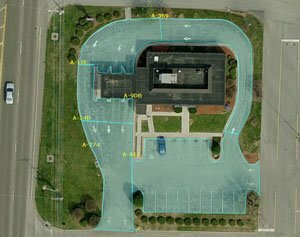 Plus, most of our aerial images are taken after the leaves have fallen off of the trees so tree canopies won’t obstruct your view of the surface you need to measure. How old are the photos? The age of the photos varies by county. Typically aerial photos are taken per county request. We offer 100% coverage of the U.S. and Canada. Go iLawn Tools and Features: What are some of the tools, what can I measure, can I save photos? What are some of the tools? What can I measure? 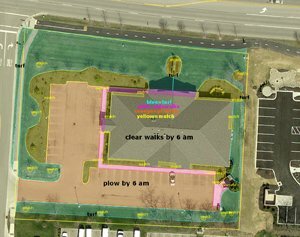 Measure any outdoor surface for any property type on Go iLawn with our measuring tools. The area tool and linear distance tool are among the most popular in the toolset. 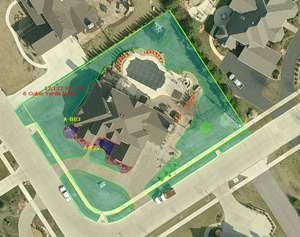 We have several tools to help you measure property features (trees, shrubs, parking spaces etc. ), as well as annotation tools to help you call out property features or make important notes. Can I save and print property measurements and photos? Yes. Measurements are formatted to an Excel spreadsheet and photos save as jpeg files. You can also save a “workspace” to your computer, which is a Go iLawn file that retains your measurements so you can reload your work to complete or modify your property measurements. A property report consists of property specific information that may include property owner information, full mailing address, county, assessor’s parcel number, mailing carrier route, subdivision and land use identifiers, phone number, lot and building size, and total assessed and taxable values. This information comes from county auditor records. You can export property reports to an Excel spreadsheet and save them to your computer. *Property reports are currently available for properties located in the U.S only. What is a neighborhood report? A neighborhood report provides users with area demographics. Neighborhood reports are derived from U.S. census results, which group properties into ‘blocks’ of census respondents by FIPS code. Average household size, number of owner occupied and renter occupied homes, household income, net worth, disposable income, and tax value of the property is often included in a neighborhood information report. Average and total annual spend on pets, maintenance, home improvement, and lawn may also be included. Technical Information: Do I need to install software, what Internet browser works best with Go iLawn, Does Go iLawn provide customer support? No. Go iLawn is web based and does not require any software installation. Go iLawn users have a username and password they can use to login to the Go iLawn website 24-hours-a-day. What Internet browser works best with Go iLawn? Internet Explorer 8 or 9, and Google Chrome are supported browsers. The most recent version of Adobe Flash player is also recommended. We do not support Safari at this time. Can I use the service on a Mac or an iPad? You can use Go iLawn on a Mac, but you must use Google Chrome for your Internet browser. Currently, you cannot use Go iLawn on an iPad because the iPad is not compatible with Adobe flash. Does Go iLawn provide customer support? Yes. Contact the Go iLawn support team by email, phone or live chat (8 am-5 pm EST Monday-Friday). We also have a customer support center, how-to videos and a recorded tutorial that users can access for help with Go iLawn. Account Information: How am I charged, what's included in a search, can multiple users access one account? * A workspace file (.lwn) is reloaded into Go iLawn. * You select to reload a workspace from the Auto Save dialog box. * You reach the boundary of your geofence and you choose to walk outside of your fence (a message will notify you when this occurs). Please Note: Go iLawn does not store your search history. Every time you look up a property you are charged for the search. 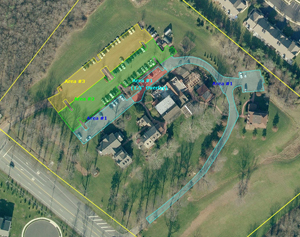 In addition to the overhead view, users can view photos of the north, south, east and west views of the property. Neighborhood photos, which are photos taken from a higher altitude are also available and included in a search. Yes. Go iLawn accounts initially come with one username. Nine additional usernames can be added to accounts in the My Account link for a total of 10 available usernames, with the exception of trial packages and power user licenses. These are always restricted to one username.